My name is Shanon Rice. I am a stay at home mother. I am originally from Muscle Shoals, AL. I left there in 2001 to attend Faulkner University where I met my husband, Brint. 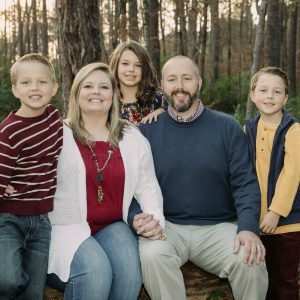 We have been married since 2003 and now live in Alexander City, AL. We have three kids, Lily, Barrett, and Kason, whom I homeschool. We currently attend Wetumpka Church of Christ. I first spent a week at Backwoods when I was 18 years old. I have been back every summer since then! I have been on the Backwoods Board of Directors since 2003. My summers are spent working at BCC where I manage the kitchen. I love camp and I love watching what it can do in a person’s life. I love spending my summers there and I love that my children are growing up there around Christian friends.